• Water use is growing at twice the pace of population growth. By 2025, two-thirds of the world population will be experiencing water “stress conditions”. • One in nine people lacks access to improved sources of drinking water and one in three lacks improved sources of water sanitation. This causes around 3.5 million deaths each year. • Between 2000 and 2006, droughts, floods and storm surges killed almost 300,000 people and caused an estimated $422 billion worth of damage. Climate change will increase the frequency and severity of droughts and floods and will lead to overall drier conditions in some world regions.5 This may heighten the risk of geopolitical destabilization and armed conflict: countries that share rivers have a statistically higher likelihood of armed conflict, and dry countries experience more conflict .67 The Jordan, Rio Grande, Mekong and Nile rivers are all especially associated with conflict risk. There was a growing sense that something had to be done to ensure that the river system was not destroyed. Policy-makers realized that they urgently required a model that could provide credible and robust estimates of current and future water availability, to enable them to set equitable and efficient allocations for competing uses. However, such a model had not yet been designed, let alone built. The complexity of modelling an entire river system – which requires handling vast amounts of often incomplete data from multiple sources of varying accuracy and reliability – had been insurmountable until recently. But prior investments in fields such as hydrology, mathematics, climate and statistics had paid off in the shape of advances that were making such a model possible. Then-prime minister John Howard identified it as a national priority and committed government funding. First, climate patterns as well as individual models of groundwater and surface water inflows and outflows had to be developed, for different parts of an area larger than France. Then these individual models had to be brought together into a single, integrated model. Starting in 2006, a team of around 100 people from 15 organizations developed ways to handle the uncertainties and link the models. The resulting system incorporated 70 individual ground and surface water models and over a century of climate data into a 61,000 gigabyte database – roughly the size of the US Library of Congress. Today the Murray-Darling Basin Authority – a government organization charged with managing the basin’s water resources – provides a real-time interactive website where anyone can view daily and yearly water levels, salt loads (electrical conductivity) and water temperatures at recording stations for all the basin’s major rivers. This provides traceability and transparency for critical decisions relating to water allocation. In a multistakeholder environment where allocation decisions can impact people’s livelihoods, trust in the data is critical for effective policy. 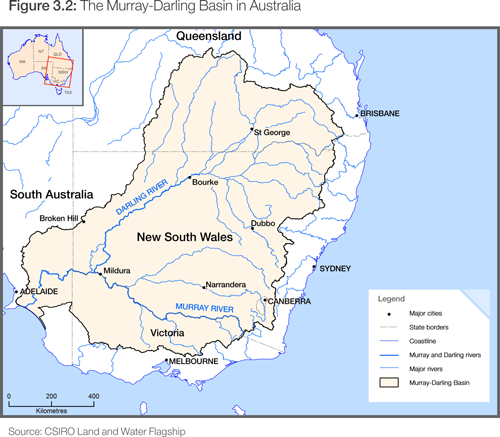 The general principles of the technologies pioneered in the Murray-Darling Basin are applicable to other river systems, although they need to be adapted to the unique environmental features of each. This is now happening for the Mekong River Basin, one of the largest in the world, which covers China, Myanmar, Lao PDR, Thailand, Cambodia and Vietnam: over 60 million people depend on the Mekong for their water supply, and many hydropower plants are planned or under construction. Another project will see yet more advanced techniques applied to model water availability, ecosystems and livelihoods for the Koshi River Basin, which stretches from China across the Himalayas, through Nepal and into the Ganges in India. In 2013, CSIRO commenced a collaborative four-year project with the International Centre for Integrated Mountain Development to inform transboundary water reforms.11 Reliable information about how much water can be safely extracted from a river system is vital to help countries reach agreements on long-term water security. As the models increase in sophistication, the challenge is to plug them into real-world decision-making processes. Building the models is hard, but so too is convincing policy-makers to act on them when they point towards the need to make difficult choices. 4 UN Water, 2013. UN-Water Thematic Factsheets. 5 Sheffield, Wood and Roderick, 2012. 6 Barnett and Adger, 2007. 7 Gleditsch et al., 2006. 8 See David Jean’s article “Mannum’s spirit returns as River Murray flows” in The Australian, 18 March 2013; http://www.theaustralian.com.au/news/mannums-spirit-returns-as-river-murray-flows/story-e6frg6n6-1226600145938?nk=ad67eceb8ab2d2391ee90a020efde1a1. 10 Smajgl, A. et al., 2011.